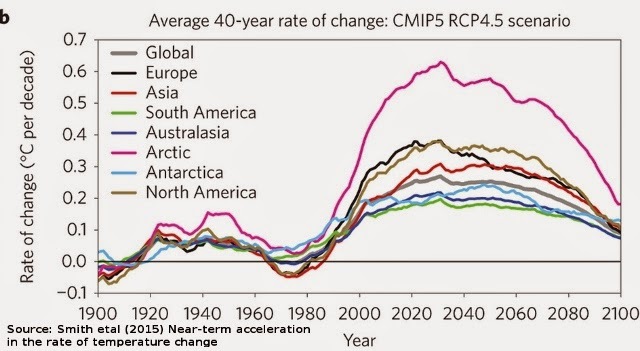 The latest research published in Nature Climate Change based on CMIP5 climate modelling, argues that we are likely to see rapid rates of temperature rise in the near term of the next 40 year period that is unprecedented in the last 2,000 years. The rate of temperature increase is likely to rise to 0.25 ± 0.05 °C per decade by 2020. Much of this rise will be disproportionately felt in the northern hemisphere regions of the Arctic, North America and Europe. This acceleration will occurr over the next 40 years despite what efforts we make to reduce our emissions. What mitigation action we do take will affect the rate of temperature rise after this near term period. "We focused on changes over 40-year periods, which is similar to the lifetime of houses and human-built infrastructure such as buildings and roads," said lead author Steven Smith. "In the near term, we're going to have to adapt to these changes." Hang onto your hats and sunscreen because this is going to become a wild ride in learning to adapt to extreme weather, especially heatwaves. The CMIP5 models were calibrated against proxy and observational data to the present showing a good representation of trends over a 40-year scale. When the models were used to calculate the rate of change between 1971 to 2020 the researchers found the average rate of change over North America to be about 0.3 degrees Celsius per decade. The team then used several common possible scenarios of future emissions with the results showing that climate change picked up speed in the next 40 years in all cases, even in scenarios with lower rates of future greenhouse gas emissions. For the business as usual scenario (RCP8.5) where greenhouse gas emissions remained high, the rate of temperature increase remained high for the rest of this century. "In these climate model simulations, the world is just now starting to enter into a new place, where rates of temperature change are consistently larger than historical values over 40-year time spans," said Smith. "We need to better understand what the effects of this will be and how to prepare for them." To put this into perspective, a NOAA page, updated January 2015, stated "For the last 50 years, global temperature rose at an average rate of about 0.13°C (around one-quarter degree Fahrenheit) per decade-almost twice as fast as the 0.07°C per decade increase observed over the previous half-century. In the next 20 years, scientists project that global average temperature will rise by around 0.2°C (about one-third of a degree Fahrenheit) per decade." mmm...NOAA might have to update that last statement after this latest research. For Australian readers, the annual mean temperature for Melbourne has been increasing at a linear trend of 0.11C per decade between 1910 and 2013. While the impact on temperatures will be most felt in the Northern Hemisphere, we will likely also see an acceleration down south. Anthropogenically driven climate changes, which are expected to impact human and natural systems, are often expressed in terms of global-mean temperature. The rate of climate change over multi-decadal scales is also important, with faster rates of change resulting in less time for human and natural systems to adapt. 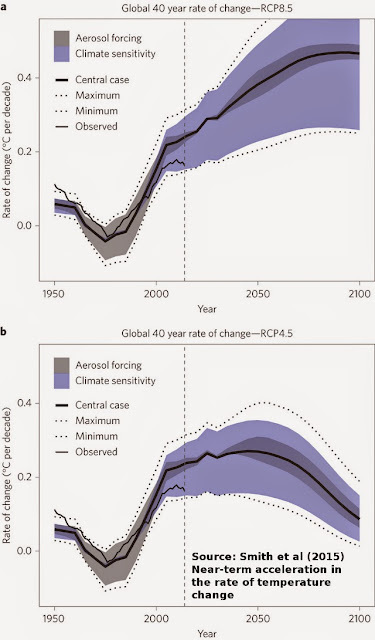 We find that present trends in greenhouse-gas and aerosol emissions are now moving the Earth system into a regime in terms of multi-decadal rates of change that are unprecedented for at least the past 1,000 years. The rate of global-mean temperature increase in the CMIP5 (ref. 3) archive over 40-year periods increases to 0.25 ± 0.05 °C (1s) per decade by 2020, an average greater than peak rates of change during the previous one to two millennia. Regional rates of change in Europe, North America and the Arctic are higher than the global average. Research on the impacts of such near-term rates of change is urgently needed. This study comes just as we might expect a spike in temperatures due to a phase shift from negative to positive in the Pacific Decadal Osccilation. Can we moderate this trend? Not in the short term. But what we do today can determine to a large part the trend in the latter part of the century. By rapidly reducing greenhouse gas emissions immediately we can reduce the temperature trend in the medium and long term. Carbon dioxide, the most important greenhouse gas, is cumulative in the atmosphere. The more rapidly and earlier we reduce our emissions, the greater long term impact we can have in reducing the greenhouse effect. But it is not straightforward either. Emissions from burning coal produce aerosol particles which help to reflect some of the sun's energy. When we reduce coal emissions, we will also reduce this pollution that also acts to provide a measure of climate cooling, a negative feedback. Whether we like it or not human society is going to need to adapt and adapt fast to the likely impacts of heatwaves and changes to rainfall. This is a global issue, particularly for urban areas where an acceleration in mean temperatures will amplify the urban heat island effect. We need urban plans in place to moderate the urban temperature increase to reduce the impact on health and infrastructure disruption. See my review of Climate change and heatwaves in Melbourne. We can expect heavier rain and more flooding too. For every Celsius degree of global temperature rise increases the atmospheric carrying capacity for water vapour by about 6 per cent making for stronger, more intense storms. At 0.8 degrees of warming storms have already gained about 5 percent increased moisture carrying capacity. At 2 degrees C of warming, storms may carry 12 per cent more water vapour unleashing torrential rains and causing greater flooding and flash flooding. What we do in reducing emissions now will impact temperatures later this century. Doing nothing or minimal reduction amounts to criminal negligence and inter-generational theft.